One of the most critical lessons new players must learn when they are new to Texas Hold’em is proper starting hand selection. The truth that a lot of players don’t realise is ultimately most two card combinations in Texas Holdem are junk and will do nothing more than cost you lots of money over the long haul. One of the most important and most often misplayed sets of hands in Texas Holdem are the pocket pairs. Ranging in rank from two all the way up to the mighty ace, pocket pairs are your bread and butter hands and when played properly will win you money time and again over the long haul. What’s so special about Pocket Pairs? Pocket pairs are extremely powerful in Texas Hold’em because often they don’t require any further improvement to win. What we mean by this is if you are dealt a pair of jacks, it is quite possible you will still have the best hand at the river even if none of the cards on the board improve your pair of jacks. There are obvious exceptions to this in that a pocket pair of twos usually will need help to win, but you can see as the rank of your pair increases you face a better chance of winning unimproved. When dealt a pocket pair, you will improve to three of a kind on the flop about one out of every eight tries. Whilst holding a pocket pair of Jacks, a Queen, King, or Ace will be dealt on the flop more than 50% of the time. Any pocket pair usually has a slight edge over even the strongest non paired two card combination before the flop. Beginners often get frustrated with pocket pairs because they feel it is very hard to improve on them and if their pair isn’t big enough, someone else will surely beat them. You should realise that pocket pairs can be your strongest asset in Texas Hold’em once you learn the proper strategies and techniques for playing them and you should welcome them into your playing range. Below we have strategies for playing low pairs, middle pairs and the premium pairs. The low pairs are definitely the trickiest of the bunch to play. There are a few things you want to keep in mind with this set of hands. First of all you will need to improve these hands more often than not to win the pot. These hands play best when you are certain the pot is going to be large and you can get in for cheap. With a large pot you are going to have excellent pot odds and you may well be able to justify the longer odds (1 in 8 times) of trying to hit your set. If you can manage to hit the set, then the great thing is you should rake in a huge pot. These hands play best in middle to late position and shouldn’t really be played from early position. There is no need to take these hands into a heads up or short handed pot against strong players from early position, lay it down and wait for a better holding. Usually if you don’t hit the flop with a low pair, its probably best to just let it go. These are pretty strong hands and can often win unimproved and because of their middle ranking, they often can make powerful back door straights. With the middle pairs you should begin to play more aggressively as there are still plenty of overcards to your pair which is likely to be hit in a multi-way pot. From middle or late position in a loose low limit game it is definitely a good idea to come in for a raise with these hands. If you are in early position and are fairly certain a raise will thin the field then a raise here is okay too. Many times in loose low limit games, a raise doesn’t work effectively to thin the field; it will however build a large pot in the event you flop a set. Knowing your opposition well can really help you make good decisions when playing the middle pairs. For starters, if a good opponent raises or re-raises before you then there is probably a fair chance that they have a premium holding and your pair is beat. The only reason to continue in a situation like that would be if the pot was huge and the pot odds justified it. You have to be careful that when you hold a medium pair you are not chasing a second best hand. Second best hands cost lots of money! In addition to a few other card combinations like Ace/King and Ace/King suited, the premium pairs are the best hands to be dealt in the game. These are the hands that will consistently win you money in Texas Hold’em. To right way to play them is aggressively. The best thing you can do in Poker is force bad players into making mistakes. Any time you raise with one of these hands and a player with a worse hand calls, then that’s what you are doing. You should be raising and re-raising pre flop with any premium pocket pair from any position. With aces and kings never be afraid to re-raise. The same is true for queens and jacks, but make sure to be careful against capable opponents, usually a third or fourth bet is a pretty good indicator of aces, kings or ace/king. Any of the premium pairs is very capable of winning unimproved, just watch out for overcards or an ace when you hold anything but aces. Most players love to play face cards so there are definitely going to be times when your queens simply aren’t good enough if a lone king falls on the flop. If a player gets bet happy as soon as a big face card falls, it’s usually a pretty good sign they just paired up. It’s okay to lay down a premium pair, from time to time they are going to lose, it is important you recognize when your beat and get out of the hand. Don’t Throw Out the Twins! 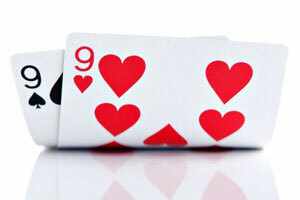 Next time you get dealt a pocket pair now you should understand how to play them. Don’t automatically throw them away, or get so attached to them that your chasing the second best hand all the way to the river. Play through the hand logically using the advice above and you’ll soon be profiting from these hands in no time.